1. Are you managing to keep all the characters straight in your head? Yes, finally. The only one I had to look up this week was Denisov, because I was confusing him with Dolokhov. And the fact that I spelled their names right without looking them up is saying something! 2. Have your tactics that we discussed in Week One changed since beginning this book? I’m no longer reading every night. Instead, I read larger portions so I can spend other nights doing/reading other things. 3. Aww, poor Pierre. Do we feel sorry for him or is it his own fault for marrying for lust? I pitied Pierre a lot in the earlier books. I felt sorry for him and I sympathized with him, but as Books 4 and 5 progressed, I started getting fed up with him and his naivety. I mean, how many times is he going to let people take advantage of him? 4. Do you think Dolokhov will get his comeuppance – not only for sleeping with Helene, but for basically bankrupting Rostov? But did he sleep with Helene? We don’t know! No one confirmed or denied it. And although he bankrupted Rostov, Rostov did nothing to stop it. He’s just as guilty. And I hope he follows through with his plan to reimburse his parents. I like Rostov more than some of the other characters, so I hope he does the right thing. 5. Who knew the FREEMASONS were part of War & Peace!? How do you feel about this? Confused. The philosophical discussions go right over my head, and the induction ceremony felt so cult-like. 6. 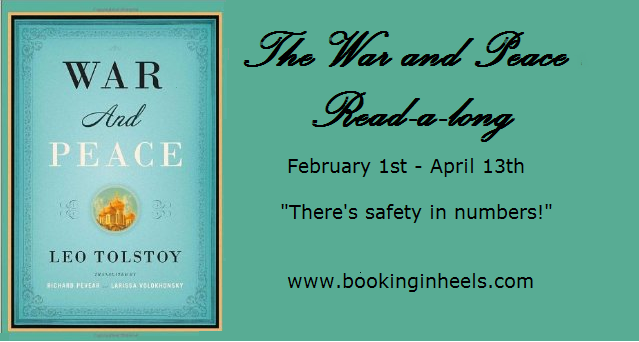 Do you think Tolstoy dislikes women as much as he seems to, or is it a form of satire? Hmm…I think he satirizes all the characters, not just the women. Did Tolstoy dislike women? I haven’t done any research on it, so if he did, maybe I’m just not reading deeply enough into the novel. Are you reading along with us? How are you liking the book so far? I flew through Book 4; it was so intriguing! Rostov seems like a bit of an entitled brat to be honest to me, so when I read about his plans to reimburse his parents I ended up going “Pfft, yeah right”. Hehe. Maybe he will do the right thing though! I’m not actually sure if I really like anybody in this book any more, everyone is either innocent and stupid or entitled and up themselves. I am enjoying the book itself though! Hehe. Hehe, I’m glad it’s not just me! Yeah, I find his family quite likeable as well, but I also wonder if maybe we just haven’t spent enough time with them for me to start disliking them yet! Time will tell! Is Denisov the one that lisps? Who proposed to one of the sisters that isn’t Sonya? It’s funny, but I didn’t pity Pierre before and now I do! He married for lust (like an idiot) and was manipulated by everybody, but now Dolokhov has been awful to him and at least he’s TRYING to make the lives of his serfs better? That’s true. In a way though, if he knows he has the reputation for sleeping with Helene (and he must) then he still hasn’t done anything to correct it which is almost worse! I agree that Rostov is just as guilty – he wasn’t exactly chained to the gambling table. I hope he reimburses his parents too. Yes, Denisov has that weird accent and he proposed to Natasha Rostov. Dolokhov proposed to Sonya (see! They have confusing names). Pierre has good intentions, but I don’t think he thinks things through, he just does whatever appeases his guilt at the moment.